Our logo heritage is important to our family and so we’ve gone back to our roots for a symbolic representation, to pull the past and present together. 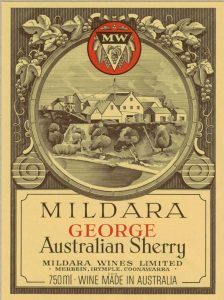 HR Haselgrove OBE, James’ father and Nick’s grandfather, was an early pioneer of the modern Australian Wine Industry and was the guiding light for his working life, running the Mildara Wine Company based on the banks of the Murray River at Merbein Victoria. He was responsible for some world renowned sherries, brandies and important forerunner red wines, from the 1950’s through to the 1970’s. We’ve taken inspiration from those early Mildara days and the labels he developed. Our new logo marries the old with the new.